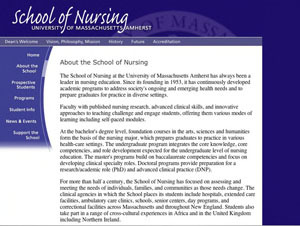 The School of Nursing at the University of Massachusetts Amherst has always been a leader in nursing education. Since its founding in 1953, it has continuously developed academic programs to address society’s ongoing and emerging health needs and to prepare graduates for practice in diverse settings. Faculty with published nursing research, advanced clinical skills, and innovative approaches to teaching challenge and engage students, offering them various modes of learning including self-paced modules. At the bachelor’s degree level, foundation courses in the arts, sciences and humanities form the basis of the nursing major, which prepares graduates to practice in various health-care settings. The undergraduate program integrates the core knowledge, core competencies, and role development expected for the undergraduate level of nursing education. The master’s programs build on baccalaureate competencies and focus on developing clinical specialty roles. Doctoral programs provide preparation for a research/academic role (PhD) and advanced clinical practice (DNP). For more than half a century, the School of Nursing has focused on assessing and meeting the needs of individuals, families, and communities as those needs change. The clinical agencies in which the School places its students include hospitals, extended care facilities, ambulatory care clinics, schools, senior centers, day programs, and correctional facilities across Massachusetts and throughout New England. Students also take part in a range of cross-cultural experiences in Africa and in the United Kingdom including Northern Ireland.